Prince of Songkla University (PSU), the oldest university in southern Thailand, consists of four campuses and one education service area which offer multifarious education programs consistent with the need of the communities. The university aims to establish excellence in researches, to provide academic services to communities as well as to take active role in preservation of national heritage in arts and culture, especially for those belonged to southern Thailand. 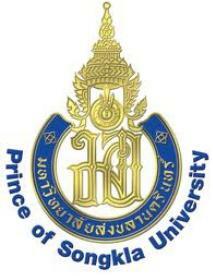 For over forty years of existence, since its inception in 1967, with the stated vision of becoming a leading research-intensive university in Asia with the primary role of producing very capable graduates, providing excellent academic services and actively involving in preservation of national heritage in arts and culture, Prince of Songkla University, has accomplished much of its objectives. At the present, in 2009, Prince of Songkla University consists of five campuses (or strictly, four campuses and one education service area). There are altogether 28 Faculties, 2 community colleges and one new faculty still in the establishment stage, the Faculty of Medical Technology. Information about all the faculties and colleges of each campus of PSU may be found at the following websites.